Who are the world's best musicians? Everyone has their own personal view on this, but for my money concert pianists win hands down. If you've ever seen a world-class pianist playing a great piece of music, like a Beethoven sonata, you'll understand exactly what I'm talking about. It takes amazing physical, intellectual, and emotional brilliance to play such a complex instrument in such a captivating way—and only a tiny proportion of the world's pianists are up to the job. But it's not just the musician who makes the music sound so fantastic: the instrument plays a huge part too. Let's take a closer look inside a piano and find out how it works! 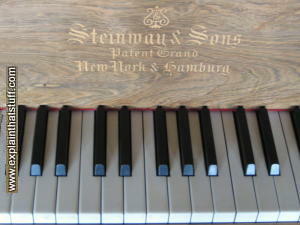 Photos (left and right): On a high note: Steinway is generally considered to be the Rolls Royce of grand pianos. 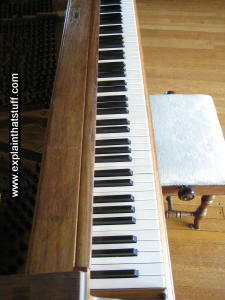 This is a superb Steinway grand dating from 1876 in the gallery at Lanhydrock, Cornwall. A piano sounds quite unlike any other instrument and, if you heard it on the radio, you'd probably never guess how it was making a noise. The confusing thing about a piano is that it's two different kinds of instrument in one: it's a string instrument, because the sounds are made with strings, but it's also a percussion instrument (like a drum) because the strings make sounds when something hits them. Listen to the music of a composer like Bartok and you'll often hear the piano being played percussively—almost beating like a drum! Artwork: How a piano works: Press down on a key and you make a small hammer shoot up and strike the corresponding strings from beneath. Release the key and the damper at the back falls down onto the strings, stopping the note. How does a piano action work? Artwork: A typical upright piano action, from US Patent 334,511: Piano by Isaac Bullard. Artwork courtesy of US Patent and Trademark Office. The little diagram up above is a hugely simplified version of what happens in a real piano. 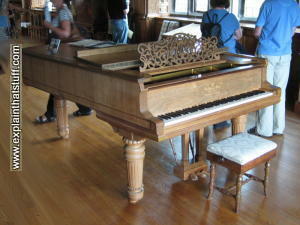 A piano's keys control the hammer and the damper through an intricate mechanism, which is known as the piano's action. Here's a typical action for an upright piano, devised by inventor Isaac Bullard of Hyde Park, Massachusetts in the late 19th century. It's an example of what's called a French-repeating action, because it allows notes to be played rapidly in quick succession. Key pivots about center point (blue). Rod (green, sometimes called the extension) leading up from the back end of the key to the damper and hammer. Rocker (red) to which the hammer and damper are attached. Rocker pivots about this point. Spoon or tongue runs up from rocker to damper. String (turquoise) mounted vertically in this upright piano. Jack (yellow) operates hammer and damper. Hammer rest (gray) supports hammer after string has been hit. Even this diagram is a simplification—I've left out quite a few pieces for clarity! Photo: Looking from the back of a piano, under the lid and into the case, you can see the strings stretched taut across the sturdy cast-iron frame. The long bass strings are on the right in this picture and the shorter treble strings are on the left. The open lid reflects the music into the audience like a giant, wooden sound "mirror". Picture adapted from an original photograph by Marie Cassetty courtesy of Defense Imagery. If a piano consisted of nothing but an action—the mechanical connection between keys and strings—no-one in the audience would hear very much. 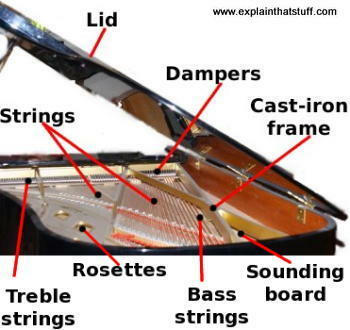 So there are lots of other parts in a piano designed to make notes sound louder or last longer. The strings of a piano stretch out horizontally away from the pianist sitting at the keyboard, just as though a piano were a guitar laid flat on its back. When you pluck a string, it vibrates, sets air molecules in motion and sends the sounds of the strings out toward your ears. To make the sounds louder, there is a large piece of wood mounted underneath them, called the soundboard (or sounding board). When the strings vibrate, the soundboard also vibrates in sympathy (resonance), just as a wine glass vibrates when a soprano sings a high note nearby. The soundboard effectively amplifies the strings so they are loud enough to hear. The lid helps the audience too: sound from the strings and the soundboard travels straight up, hits the lid, and reflects out toward the audience. That's why it's always better to sit on the right of the pianist and why concert hall seats to the left of (and behind) the pianist are generally much cheaper. Photo: Another view of the Lanhydrock Steinway Grand. 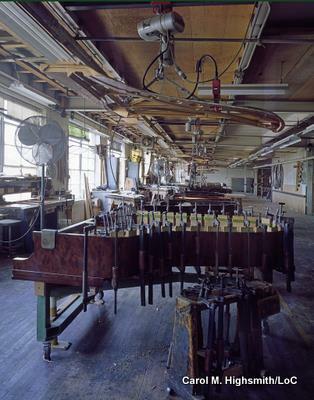 Photo: A grand piano being assembled at the historic Steinway factory in Queens, New York. Note the sturdy cast-iron plate hovering up above, ready to be lowered into position. Its job is to stop the piano "imploding" from the tension of the strings. Credit: Photographs in the Carol M. Highsmith Archive, Library of Congress, Prints and Photographs Division. While the 88 keys on a piano control the musical notes that the pianist can make, the three pedals determine how loud or soft these notes are and how long they last. The pedal on the left is called the soft pedal. Most of the keys on the keyboard hit two or three strings simultaneously when you press them, so you get a richer and louder note. However, if you press the soft pedal down, the hammers that play the notes shift slightly to one side so they contact fewer strings—making a quieter note. The middle pedal is called the sostenuto pedal: when you press it down, it temporarily deactivates the dampers for the notes that you're playing at the time, and makes them last quite a bit longer. The pedal on the right is called the sustaining pedal. Pressing it down raises all the dampers up in the air so all the notes last longer. Artwork: How the strings are supported inside a piano frame—as shown in a typical Steinway design from the 19th century. The keyboard is at the bottom, so the long bass strings (green) are on the left, the mid-pitch strings are in the middle (orange), and the high treble strings are on the right (yellow). Note how the deepest and longest base strings have to cross over and above the treble strings. The incredible tension of so many taut strings is balanced by the strong metal "skeleton" framework (blue) inside the wooden case (brown). Design for a piano frame by Theodor Steinway from US Patent 314,742: Piano Frame, March 31, 1885, courtesy of US Patent and Trademark Office. Since each note can have up to three strings, it turns out that there are well over 200 strings inside a piano—each one stretched really tight. To stop the strings from collapsing the entire piano inwards, the rim and case are reinforced by a huge, heavy cast-iron plate. The plate sits just above the sound board and large metal holes around its edge (known as rosettes or portholes) allow the sound to come up through it. In an upright piano, things are slightly different. The strings run vertically at the back of the case and the hammers strike them by moving horizontally. It's like a grand piano standing on its end—literally upright. That's a very quick tour of a piano, one of the world's most amazing instruments! 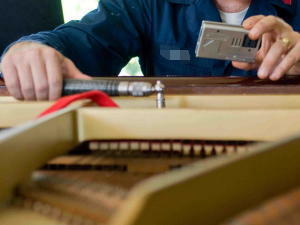 Photo: Tuning a piano is a skilled job that involves tightening the strings by precise amounts using a tuning hammer (really a wrench) like this. Here the tuner is using a handheld, electronic tuner to check the pitch of the strings as he adjusts them. Picture by Joshua Valcarcel courtesy of US Navy. The Piano: The Complete Illustrated Guide to the World's Most Popular Musical Instrument by Jeremy Siepmann. Hal Leonard Corporation, 1998. Lots of information and plenty of color illustrations in this history of pianos. Piano: The Making of a Steinway Concert Grand by James Barron. New York: Times Books, 2006. A very readable little paperback that describes the fascinating story of how one Steinway piano was put together, starting from the forest that supplied the trees and ending in the concert hall where the instrument made its musical debut. People and Pianos by Theodore Steinway. Hal Leonard Corporation, 2005. An insider's view of Steinway by one of the members of the family, originally written in the 1950s and since revised and updated. There are zillions of books on learning to play piano. Any decent book should really convince you to take proper piano lessons with a good teacher, if you're serious about playing properly. The Complete Idiot's Guide to Playing Piano by Brad Hill. Alpha Books, 2006. A basic introduction. The Piano Handbook by Carl Humphries. Backbeat, 2003. An alternative guide that seems to score highly in Amazon reviews. Patents are always worth exploring if you like real technical detail. Here are a few (of the many hundreds) of piano patents filed by Steinway that you can find at the US Patent and Trademark Office and European Patent Offfice. US Patent 314741: Piano Frame by C. F. Theodor Steinway, March 31, 1885. 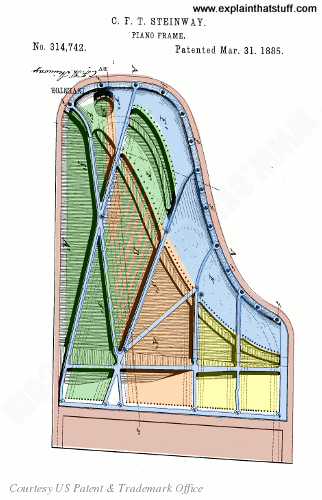 Steinway's 19th-century piano frame design explained in detail. US Patent 1214237: Sostenuto device for pianos by Theodore E Steinway, January 30, 1917. 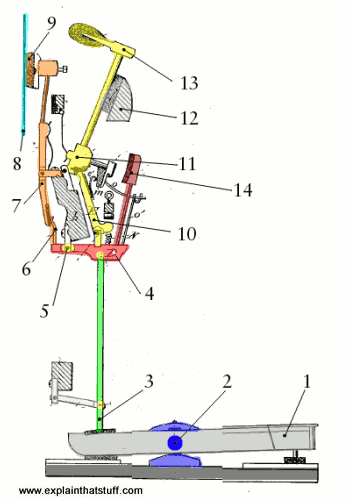 One of Steinway's early sostenuto (sustain) mechanisms. EP 1913575: Method for improving the sound of musical instruments by Hans-Ulrich Rahe, December 17, 2008. A very interesting example of the latest in scientific thinking on piano design: how can the primary sound made by the strings be improved by reducing the effects of vibrations happening in other parts of the instrument? Steinway's Grand Ambitions for Its Pianos in China by Javier C. Hernández. The New York Times, July 9, 2016. Can growing Asian interest in the piano save the fortunes of the leading, luxury instrument maker? The challenges of making a digital piano sound real: BBC News, April 17, 2014. Joe Ierardi of Synthogy explains how to make an "artificial" piano sound real. Notes of Sorrow in Changes at Steinway by James Barron. The New York Times. July 12, 2013. How the sale of Steinway worried pianists, who fear the company's tradition of excellence might be compromised. For More Pianos, Last Note Is Thud in the Dump by Daniel J. Wakin. The New York Times. July 29, 2013. Where do old pianos go when they die? Instead of being recycled or repaired, many are now smashed to pieces with sledgehammers.